In Media, the news spread about the Final Seventh Pay Commission Report Submission on 19th November, 2015 or 20th November, 2015. 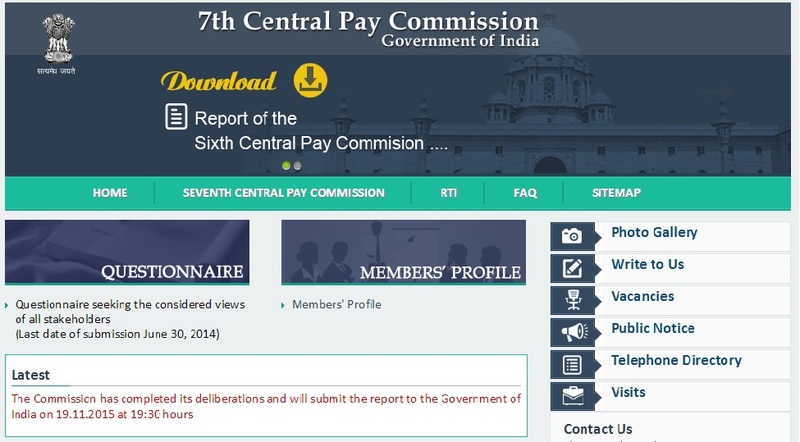 The Seventh Pay Commission has confirmed that the Final Report of the Seventh Pay Commission will be submitted on 19th November, 2015 at 19:30 hours. 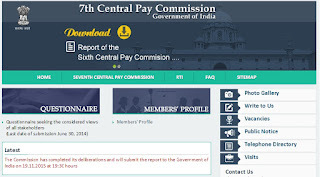 Earlier, Government of India has appointed the Seventh Central Pay Commission comprising Justice Shri Ashok Kumar Mathur as Chairman, Shri Vivek Rae as full time Member, Dr. Ratin Roy as part time Member and Smt. Meena Agarwal as Secretary, in a resolution dated 28th February, 2014. The Commission is headquartered in Delhi and has been given 18 months from date of its constitution to make its recommendations. To this end the Commission will set up its team of Officers, Advisers, Institutional Consultants and Experts and call for required information and documents from Ministries and Departments of Government of India and various Service associations. The Commission has extended its term from August, 2015 to December, 2015.